The unpretentious, homey American GI Forum restaurant at 2002 N Street is a Tex-Mex bargain whose popular specials make this a busy joint. But unless you’re a South Omahan or get tipped off to the place by someone, this best-kept-secret is likely to remain unknown outside its loyal following. After all, it has no website or Facebook page. You won’t find ads for it anywhere. It’s low profile is a shame, not because it starves for business – quite the opposite is true. But proceeds from this non-profit help support the activities of the veterans club under whose auspices and roof it operates. The Omaha chapter of the American GI Forum, a national Hispanic veterans organization founded in 1948, provides scholarships to area students and assists down-on-their-luck folks who need help paying utility bills. 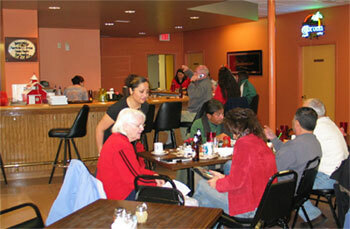 The veterans clubhouse is located upstairs in the sprawling, two-story building and the restaurant is downstairs. Reminders of the military connection are visible on the eatery’s walls, where plaques, photographs and photocopied stories extoll the exploits of area Hispanic veterans. The financial sacrifices and sweat equity that went into obtaining the facility are also detailed. You’ll also find living history among the patrons, including charter member and Korean War vet Ricardo “Rick” Arellano, 85, who’s justifiably proud of the Forum. This GI Forum chapter formed in 1957 and the membership acquired the then-condemned building in 1962, doing most of the extensive repairs and renovations themselves. One couple even mortgaged their home to help finance the project. Members also funded the work through, what else?, tamale sales. The structure underwent a major renovation and expansion in 2006. The restaurant’s always been part of the set-up. It’s not unusual for a service club to have a commercial kitchen that puts out occasional meals for public consumption. Think VFWs or Sons of Italy. What distinguishes the Forum is that it operates a full-service restaurant and bar open to the public six days a week. The mostly Spanish-speaking cook staff churns out breakfast, lunch and dinner. The sizable menu is comparable to that of a traditional Mexican dining spot. So is the quality of food. Manager Luis Valencia, whose father Leandro, is a club charter members, says many of the recipes used today were created by the late Nettie Escamilla Vela, the namesake of Bellevu’se beloved hole-in-the-wall, Nettie’s Fine Mexican Food. If you’re not hung up on gourmet preparations or a stickler for strictly authentic dishes, and if you can do without fancy schmancy digs, then this is a must get-to. The space has a church basement social hall look with its tile floor, but the memorabilia, dartboard alley and flat screen TVs lend some warmth and charm . The tacos, enchiladas, tamales, tortas and red chili stand up to some of the best around these parts. There are several chili dinners to choose from. The menudo has its fans. Hot wings are a concession to this ubiquitous finger food staple. Breakfast specials, including chorizo and eggs, and combo platters with eggs, potatoes, bacon, beans and rice, are legendary. Lines form Thursdays for the dollar taco and buck seventy-five margarita specials. Similar specials pack ’em in on Fridays. Between its big lot and the surrounding streets, there’s ample parking to handle the crowds. The regular prices are easy on the wallet, too, with most dinners priced $6 to $8 and ala carte items from $1.75 to $3. This laid-back neighborhood landmark is a casual, family-friendly place where the grub and spirits and ready smiles make you feel at home. Valencia confirms that almost all of the restaurant’s new business is by word of mouth. The fixtures and newbies account for a diverse clientele. A recent visit found a cross-section of patrons variously chowing down or throwing back a few at tables or at the curved bar. A dart game was in progress in a corner. Music spilled out over speakers. The wait staff was attentive. Regulars include a heavy dose of South O denizens and natives. “If you’re originally from South Omaha you’ll run into somebody you know,” vows Valencia. Hours: 11 a.m. to 9 p.m. Tuesday, Wednesday, Friday; 10:30-9 Thursday; Saturday 10-9; Sunday 8:30-7:30. Closed Mondays. For more info, call 402-733-9740.